A report released last week showed that young public school teachers will forfeit thousands of dollars in pension wealth due to states' current pension policies. In the seven days since the report's release, broadcast nightly news, weekday evening cable news, and major print outlets have completely ignored its findings and its implications for the largest class of workers in the U.S.
CNN's Piers Morgan viciously lashed out at critics who accused him of sensationalizing an interview with transgender activist Janet Mock, making a number of personal attacks against transgender activists and dismissing his critics as hysterical, dishonest, and "stupid." His over-the-top reaction to criticism highlights that even LGBT-friendly journalists can do serious damage when they ignore the voices and concerns of LGBT people. Following a February 4 interview with Mock about her new memoir Redefining Realness, Morgan was criticized for his overemphasis on Mock's body, physical appearance, and romantic relationships with men. Throughout the segment, on-screen text described Mock as being "a boy until age 18." In an interview with BuzzFeed, Mock accused Morgan of "trying to do info-tainment" and criticized him for sensationalizing transgender people while avoiding a substantive discussion about her book - a sentiment that was echoed by many critics. Mock didn't accuse Morgan of being transphobic - rather, she challenged him for asking the same kinds of questions that are repeatedly used to objectify transgender people's bodies. Following the interview, Morgan hosted a panel discussion between three cisgender people, two of whom ridiculed Mock for criticizing Morgan's actions. After being criticized by a transgender activist for being disrespectful toward transgender people, CNN's Piers Morgan allowed two panelists to make a series of transphobic remarks and attack the activist's character with impunity. Morgan came under fire after a February 4 interview with transgender activist Janet Mock, who recently published her memoir, Redefining Realness. 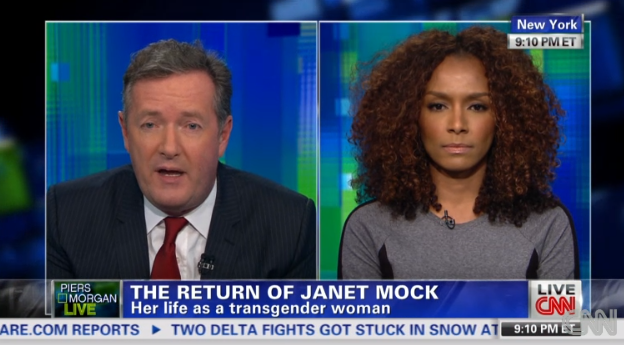 During the interview, Morgan fixated on the physical aspects of Mock's identity as a transgender woman and CNN included an on-screen description stating that Mock "[w]as a boy until age 18." Mock criticized Morgan for sensationalizing transgender people and misgendering her, prompting Morgan to lash out against her on Twitter, calling her "shameful" and a "coward." Broadcast and cable evening news coverage touched upon a variety of economic topics, including deficit reduction, economic growth, and entitlement reform throughout the second quarter of 2013. A Media Matters analysis shows that many segments lacked proper context or input from economists, while some topics went largely underreported. Throughout the first half of 2013, broadcast and cable nightly news overwhelmingly discussed Social Security in an unbalanced and negative light by repeatedly insisting that the program is insolvent, must be cut, or poses a risk to long-term fiscal security. In the weeks leading up to an automatic doubling of federal student loan interest rates, broadcast and cable nightly and weekend news devoted little time explaining the effects of the rate hike and the expiration of other programs designed to help American students, graduates and families with increasingly high education costs. In 2007, Congress passed a law to reduce interest rates on federal subsidized student loans, the Stafford Loan program, to 3.4 percent. The law was intended to reduce college costs and increase access to higher education. The Budget Control Act of 2011 ended several provisions of previous law; foremost setting an expiration date of July 1, 2013, for Stafford Loan interest rates. Today, those rates automatically double to their previous 6.8 percent. Media Matters research found the looming student loan deadline has been largely ignored by major news networks in the past several weeks. Since May 23, the date the House of Representatives passed a party line student loan plan of its own, primetime and weekend television news has offered just 13 brief segments on student loan issues. Absent from media analysis has been any real discussion of economists' recommendations for dealing with student debt. Many economists, including Nobel Prize winners Joseph Stiglitz and Paul Krugman, have supported various efforts to defray college costs, expand federal funding, and provide restructuring and refinancing options for student and family borrowers. In May, the Consumer Financial Protection Bureau released a report on student loan affordability. It found that expanded refinancing options for student debt could have a simulative effect on economic growth, household formation and homeownership among borrowers. The Federal Reserve Bank of New York had previously found that student debt was a driving force in decreasing home and automotive purchases among recent graduates. The rate increase set to take effect on July 1 will directly affect millions of Americans while making college less affordable for prospective students. The Congressional Research Service estimated that the higher rate could cost average borrowers more than $1,000 to take out a subsidized federal loan. College graduates are saddled with an enormous debt burden - more than $1 trillion through 2013, according to The New York Times. Media Matters conducted a Nexis search of transcripts of Sunday and evening (defined as 5 p.m. through 11 p.m.) programs on CNN, Fox News, MSNBC, and network broadcast news from May 23 through June 30. We identified and reviewed all segments that included any of the following keywords: student loan, college loan, student debt, college debt, student, debt, loan, and college. The following programs were included in the data: World News with Diane Sawyer, This Week with George Stephanopoulos, Evening News (CBS), Face the Nation, Nightly News with Brian Williams, Meet the Press with David Gregory, Fox News Sunday, The Situation Room, Erin Burnett OutFront, Anderson Cooper 360, Piers Morgan Live, The Five, Special Report with Bret Baier, The O'Reilly Factor, Hannity, On the Record with Greta Van Susteren, Hardball with Chris Matthews, Politics Nation with Al Sharpton, All In with Chris Hayes, The Rachel Maddow Show, and The Last Word with Lawrence O'Donnell. For shows that air re-runs (such as Anderson Cooper 360 and Hardball with Chris Matthews), only the first airing was included in data retrieval. Media Matters only included segments that had substantial discussion of increasing student debt or the July 1 interest rate deadline. We did not include teasers or clips of news events, and re-broadcasts of news packages that were already counted on their initial broadcast in the 5p.m. to 11p.m. window. Media coverage of the automatic spending cuts commonly known as sequestration has tapered off since the policies went into effect on March 1. This drop in coverage comes as more Americans report having personally felt the effects of the cuts. Evening news coverage throughout April touched upon several economic issues, including income inequality, deficit reduction, and entitlement cuts. A Media Matters analysis of this coverage reveals that many of these segments lacked proper context or necessary input from economists, while some networks ignored certain issues entirely. Dana Loesch: A Spoon "Can Be Classified As An Assault Weapon"
A group named Donors Trust has been funneling far more money than ExxonMobil ever did to climate denial groups, but because the source of the funds remains largely hidden, the public has been unable to pressure the donations to stop as they did with Exxon. A small portion of Donors Trust's funding was recently revealed by the Center for Public Integrity, yet even that small portion has significant ties to the Koch brothers and other fossil fuel interests. Between 2008 and 2011, Donors Trust doled out over $300 million in grants to what it describes as "conservative and libertarian causes," serving as "the dark money ATM of the conservative movement." Donors Trust enables donors to give anonymously, noting on its website that if you "wish to keep your charitable giving private, especially gifts funding sensitive or controversial issues," you can use it to direct your money. Several of these organizations have sown confusion about the science demonstrating climate change. The Heartland Institute, which The Economist called the "world's most prominent think tank promoting skepticism about man-made climate change," received over $14 million from Donors Trust from 2002 to 2011, making up over a quarter of Heartland's budget. in 2010. In 2012, Heartland launched a billboard campaign comparing those that accept climate science to The Unabomber, Charles Manson, and Fidel Castro. Several corporate donors distanced themselves from the organization, but Donors Trust made no comment. Heartland removed the billboard soon afterward but refused to apologize for the "experiment." Meanwhile, The Committee for a Constructive Tomorrow (CFACT) received over $4 million from Donors Trust from 2002 to 2011, accounting for over 45 percent of CFACT's budget in 2010. The highest-paid member of CFACT's staff is Marc Morano, who runs a website that pushes misleading attacks on climate science. Morano defended Heartland's billboard and said that climate scientists "deserve to be publicly flogged." Despite Morano's sordid background, CNN twice hosted him to "debate climate change and if it is really real" without disclosing that he has no scientific training and is paid by an industry-funded organization. CFACT lists the Forbes columns of Larry Bell, who calls global warming a "hoax," as "CFACT research and commentary." The organization is advised by several prominent climate misinformers, including Lord Christopher Monckton and Willie Soon. The Center for Public Integrity (CPI) has revealed the sources of approximately $18.8 million of Donors Trust's funding from 2008 to 2011, culled from Internal Revenue Service filings. That leaves over $281 million in anonymous funds during that period, assuming that the organization gives out approximately as much as it takes in each year. While the individuals and corporations funding Donors Trust remain largely hidden, we know that at least five separate foundations connected to Koch Industries have given over $3.8 million to Donors Trust in recent years. Koch Industries, owned by brothers Charles G. and David H. Koch, is the largest privately owned company in the U.S. and controls several oil refineries and pipelines. Why Is CNN Hosting Conspiracy Theorist Alex Jones? CNN's Piers Morgan hosted noted radio host and conspiracy theorist Alex Jones to discuss his petition to deport Morgan because of his views on gun control. Jones is a 9/11 truther who has a history of inflammatory and baseless remarks. On Monday's edition of Piers Morgan Tonight, Morgan asked Jones to explain his "Deport Piers Morgan" petition. Jones responded with a lengthy tirade that filled two segments. His comments included pushing the debunked myth that "more guns means less crime," claiming that "1776 will commence again if you try to take our firearms," referring to antidepressants as "mass murder pills" that cause people to commit violence, and claiming that "megabanks" have "taken everybody's guns but the Swiss and the American people, and when they get our guns, they can have their world tyranny." The Oklahoma City Bombing was "carried out by intelligence agencies" with "Bill Clinton's involvement." The government is using products like juice boxes to "encourage homosexuality with chemicals so that people don't have children." The U.S. government was behind the 9/11 attacks. Jones describes himself as being on "the front lines of the growing global information war from ground zero to the occult playgrounds of the power-mad elite. Jones predicted the attacks on September 11th, 2001 and is considered one of the very first founding fathers of the 9-11 Truth Movement." The government has set up FEMA concentration camps in America, and "the military-industrial complex is transforming our once free nation into a giant prison camp." President Obama is transforming the United States into "something that resembles Nazi Germany, with forced National Service, domestic civilian spies, warrantless wiretaps, the destruction of the Second Amendment, FEMA camps and Martial Law." The BP oil spill "could have been manufactured." Jones has also pushed numerous conspiracy theories about weather control, mass sterilization, and the Space Shuttle Columbia disaster. In June 2012, Jones' Infowars.com promoted the myth that the Environmental Protection Agency (EPA) was using drones to spy on Midwestern ranchers. Finally, the radio host has declared that Obama's birth certificate is a fraud. Jones' lengthy history of pushing absurd conspiracy theories should disqualify him from being mainstreamed on media outlets such as CNN. Conservative media figures have long insisted that top marginal income tax rates effectively target small businesses. This "zombie lie" has sprung up throughout President Obama's first term as an argument against Democratic proposals to renew the Bush-era rates only for middle- and low-income Americans. Despite continual efforts by experts to debunk this claim, media figures continue to repeat these lies in the 2012 edition of the fight over high-income tax rates. CNN anchor Piers Morgan hosted a "debate" on climate science between Bill Nye "The Science Guy" and professional climate misinformer Marc Morano. As Morano spewed myths about climate change, CNN failed to disclose that he has no scientific training and is paid by an industry-funded organization.